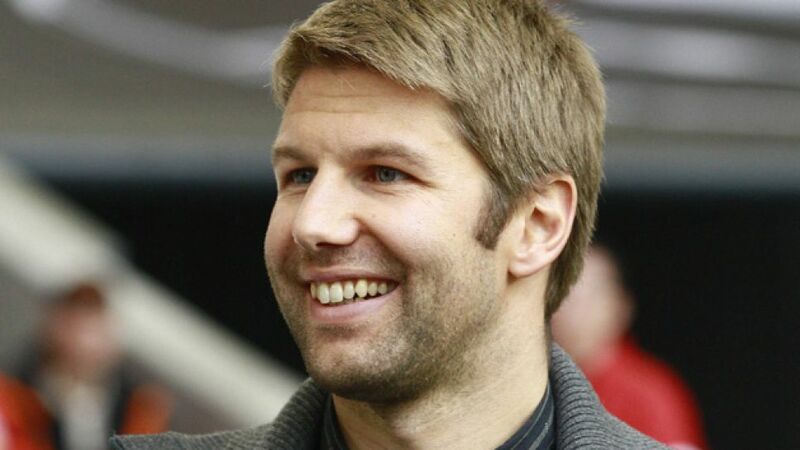 London/England - Thomas Hitzlsperger boasts a wealth of experience few in football are able to match. A Bundesliga champion with VfB Stuttgart in 2007, the 32-year-old also enjoyed successful spells in the Premier League and Serie A, as well as competing in the UEFA Champions League and the 2006 FIFA World Cup with host nation Germany. The former Aston Villa FC favourite has been busy since hanging up his boots in 2013 as well, appearing as a pundit for German television station ZDF at the 2014 FIFA World Cup and as a co-commentator for the Bundesliga’s international coverage. bundesliga.com: Thomas Hitzlsperger, the Champions League group stage is underway and once again four German clubs are involved. What does that mean for the Bundesliga? Thomas Hitzlsperger: It simply confirms the quality of the Bundesliga, which has taken another step forward over the past few years. Once again we have four clubs in good form, perhaps with the exception of Schalke right now, but Leverkusen are looking excellent at the moment, Bayern too of course - they’re going to be among the favourites again - and Dortmund are a very good side as well. I think the Bundesliga has once again underlined that it’s among the best leagues in the world, if not the best. bundesliga.com: How do you rate the four clubs’ chances of progression? Hitzlsperger: I think they’re all capable of getting through the group stage. I hope Leverkusen can keep up their good form, too. I’d expect Bayern and Dortmund to reach the next round. Schalke we’ll have to see. They’re not in the best form right now but even so, they’ll be aiming to get through. bundesliga.com: Of course there were three Bundesliga-versus-Premier League duels on the opening matchday. You have plenty of experience in both leagues. How do they compare at present? Hitzlsperger: It’s remarkable, really. The Bundesliga has done rather well comparatively over the past few years, leaving the Premier League behind in many respects. But you have to consider how much money the Premier League has invested in new players. The amount of money they’ve been spending as a result of TV rights and international marketing is incredible. bundesliga.com: Of course you played in the Champions League after winning the 2007 Bundesliga title with VfB Stuttgart - how does it compare with domestic football when you’re out on the pitch? Hitzlsperger: It was a big jump for us because none of us really had much Champions League experience at the time. You got a special feeling playing in the Champions League, but we were too inexperienced to make an impact. We played well in the Bundesliga but we never really managed to transfer it onto the Champions League stage. The Bundesliga is obviously very high quality but the Champions League is another step up and we were simply too inexperienced. bundesliga.com: You spent 11 years in the FC Bayern youth system. What is this winning mentality that all Bayern players seem to have drilled into them? Hitzlsperger: It’s made very clear there that no matter where you go, you are the favourites. You are always the team to beat in Germany. You also have all the best players because all the young players want to move to Bayern due to the outstanding facilities there and the increased chances of success. That was certainly the case with me. It was a great experience and it really taught me not to settle for second best. bundesliga.com: Bayern did come off second best to Real Madrid in the Champions League last term, though. What do they need to do better this season to get back to the summit of European football? Hitzlsperger: I think that this is going to be a very important season for Pep Guardiola. Bayern had a successful first season under him but in spite of winning the domestic double, you got the feeling that not everyone was completely satisfied. I think winning the double in your first season is a huge success but he will want to be the No1 in Europe too and that means winning the Champions League. It’ll be interesting to observe, but Bayern have strengthened once again. I’m interested to see how Pep Guardiola approaches the campaign. He’s already emphasised how much of a strain the World Cup was on his players. It’s not going to be an easy season for Bayern, but I still think they’ll be right up there come the end. bundesliga.com: Champions League means midweek matches and straight afterwards there’s an Englische Woche in the Bundesliga too. What’s it like as a player when the games are coming thick and fast? Do you have any time at all to prepare for matches or is it all just a blur? Hitzlsperger: Personally I really liked it because you didn’t have to train as much - it was straight into the next game and players prefer that to waiting around during the week. It’s one game after another but if you’re fit and healthy then there’s nothing better than playing in the Bundesliga during the week as well. There’s also something special about evening matches and playing under floodlights. bundesliga.com: Leverkusen have been in excellent form since Roger Schmidt took over in the summer. Do you think they could finally be ready to shed their ‘Neverkusen’ tag? Hitzlsperger: It’s too early to judge after just three matches but Leverkusen have been superb so far. Sometimes when a team starts so well under a new coach it takes a while for the other sides to catch up and work out why they’re playing so well and develop a way of stopping them. I don’t think they’re quite ready to win the title, even if they have strengthened really well. I can’t see them surpassing Bayern and Dortmund over the 34 matches. Even so, I have a lot of respect for the work Roger Schmidt is doing there. bundesliga.com: And your former club Wolfsburg are back in the Europa League. Many people are saying they could be dark horses in the Bundesliga this season - do they have what it takes to break into the top four? Hitzlsperger: With the resources they have, it should definitely be their goal to compete in the Champions League. They need to find some consistency, but I think in Dieter Hecking they have a coach who can achieve that. Still, that’s what makes the Bundesliga so interesting - there are several clubs capable of making an impact, not just Wolfsburg. Hoffenheim are a very good team, as are Borussia Mönchengladbach. Both clubs have forward-thinking coaches and make the most out of what they have. I’d say Wolfsburg are one of three or four teams capable of breaking into the top four.